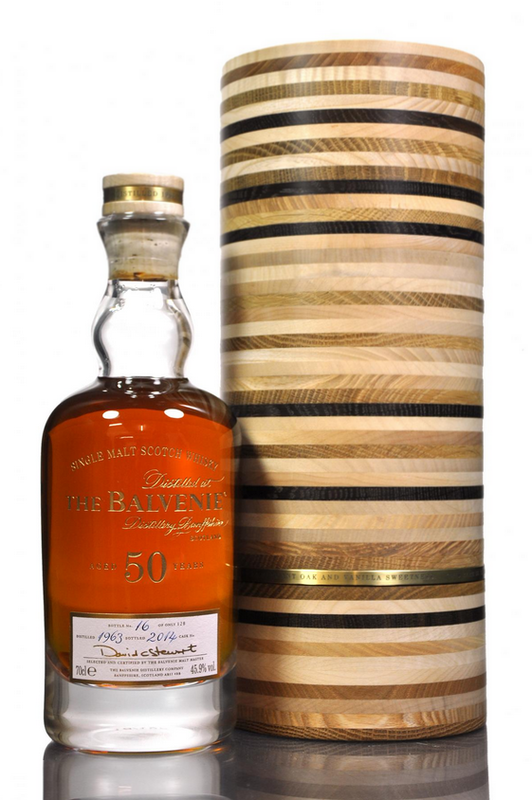 Every now and again a whisky is launched which becomes an almost instant classic. Mention the name alone and the eyes of investors and collectors light up with eager recognition. 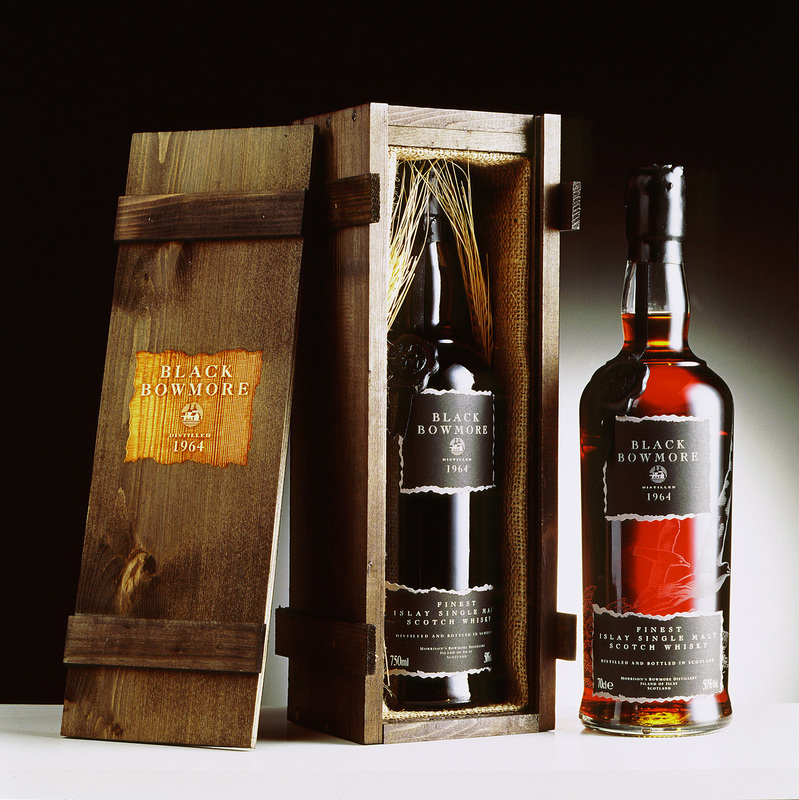 Such a whisky is Black Bowmore, initially marketed in 1993, with further releases following during the next two years. Here we ask members of the Bowmore team to reveal some of the background to this epic bottling. Who decided on the name? The expression really named itself; being sherry matured and so unusually dark it was only natural that it should be called Black Bowmore. Had Bowmore always been aware this was likely to be great whisky and earmarked these casks accordingly? All the casks in Bowmore’s legendary No. 1 Vaults were, and continue to be, regularly checked. The Black Bowmore casks would have been selected for bottling accordingly, and although it is unlikely that anyone at the time could have predicted it would become so iconic, we knew that it was a truly great whisky. 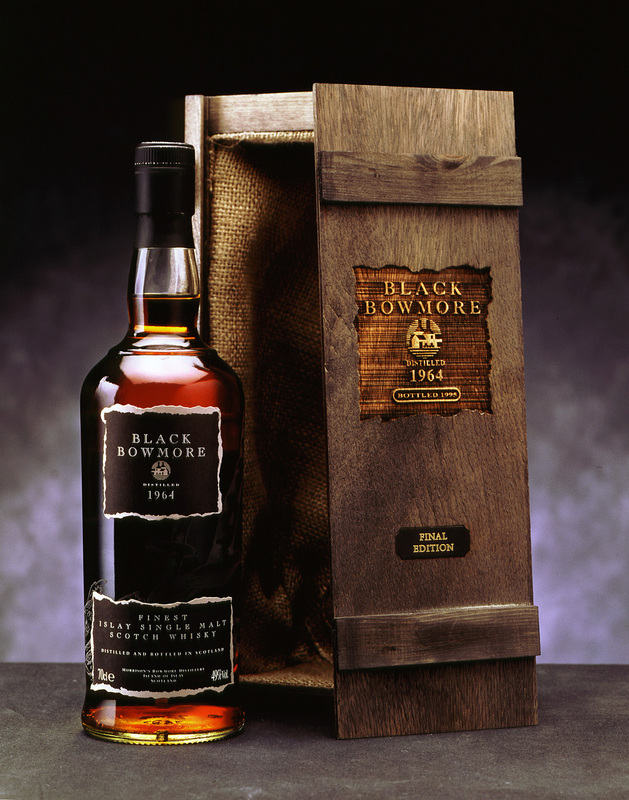 So just what is it about the Black Bowmore that makes it such a classic? Distilled in 1964 at Bowmore, Islay’s first single malt distillery and one of Scotland’s oldest distilleries, the spirit was filled into oak casks which had previously been used for maturing rich, sweet Oloroso sherry. The casks were transferred to the distillery’s No.1 Vaults, Scotland’s oldest maturation warehouse located below sea level on the shores of Loch Indaal, to mature in a truly unique atmosphere. The young spirit developed into one of the most incredible whiskies ever produced in Scotland with an aroma that is incomparable; rich, sherry, cocoa, dark cherries, toffee, chocolate orange and mature oak. On the palate, the concentration of flavours is inimitable, gently rolling over the tongue like waves to the shore. Of the 5,812 bottles produced, very few exist today and have become extremely collectible. What are the main influences on its character? The main influences on the character of Black Bowmore are the new-make spirit matured in first-fill sherry casks and the maturation process in Bowmore’s legendary No.1 vaults. Being matured below sea level produces a perfect recipe of balance and richness, peat smoke and fruit. Was there anything special about the casks used? The casks used to produce Black Bowmore are perfect examples of the exceptional quality sherry casks selected by Bowmore to be ideally suited for long maturation. Was the distillery using a lot of first-fill oloroso casks at the time, or would this have been really unusual? Sherry filling was used in a higher proportion during the 1960s, and this was a style known to suit Bowmore, however Black Bowmore is proof of the quality of the wooden casks and conditions in our No.1 Vaults. I understand you replace the wax capsule for buyers if it is cracked. How many times have you done that? We don’t replace the wax, however we do re-seal with a spun capsule if the wax has broken off. We have probably replaced only two or three over the years. 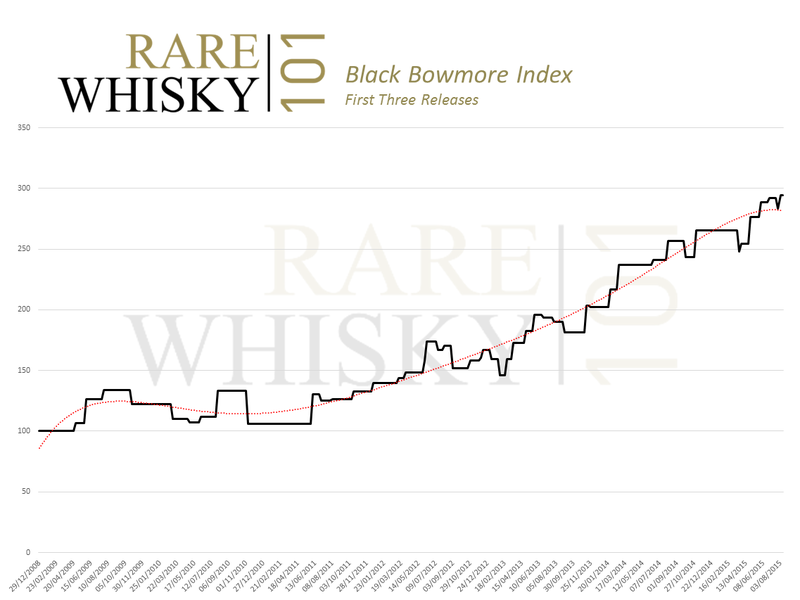 Did Bowmore ever expect Black Bowmore to become so iconic and increase so dramatically in value and collectible status? It was understood at the time of release that Black Bowmore was an exceptional whisky; however no one could have predicted such a stratospheric rise in collectability. Black Bowmore remains one of the most iconic expressions to come out of our distillery. What were Bowmore’s original tasting notes? I recall way back in 2011, I think… maybe 2012… I had what could be called an interesting conversation with Mark Gillespie from Whiskycast about the whole topic of investing in bottles of whisky. Mark appeared to be strongly against whisky being used as an investment which is great; as always, whisky has the ability to generate passion among its fans and also healthy debate. So why reference a conversation which happened some four years ago? We had a very specific conversation about Black Bowmore and the relative price consistency the bottles had been achieving at auction. 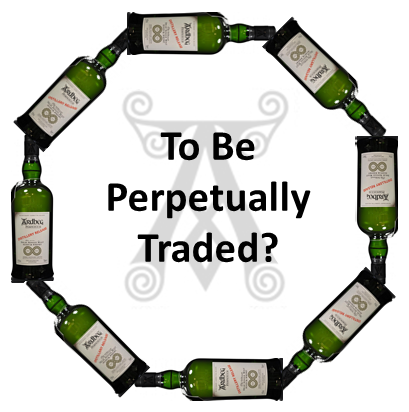 If something has a completely consistent price it’ll never make it as an investment and, almost like clockwork, the first three Black Bowmore’s had been selling for around £1,600 each. In-fact throughout the latter part of 2010 and into early 2011 the first three releases could be picked up for exactly that – £4,800 for the trilogy. Wind the clock forward a few short years and let’s take a look the state of play now. IF you’d bought these three icons of whisky at what appeared to be the capped max price of £4,800, would that price-ceiling turn out to be made of impermeable stuff or would it subsequently prove to be glass? Let’s not forget these bottles originally retailed for around £100 per bottle so the increase-over-retail price was already vast. Could these bottles physically extend further gains or were they already exhausted? An understatement would be to say they’ve done okay! In-fact they’ve performed remarkably well. The chart below shows their performance since 2008. The early years of the chart clearly illustrate the lacklustre performance and near stagnation before we started to see positive momentum. Rather than vast spikes in their performance, it’s encouraging to see the rate of more recent growth is relatively consistent. Natural peaks and troughs give way to a fairly regular pattern of increasing values. While these are not the best performers in absolute terms, an almost tripling in price over the last four years from an index value of 106.19 at the end of May 2011 to 294.25 at present is clearly impressive. 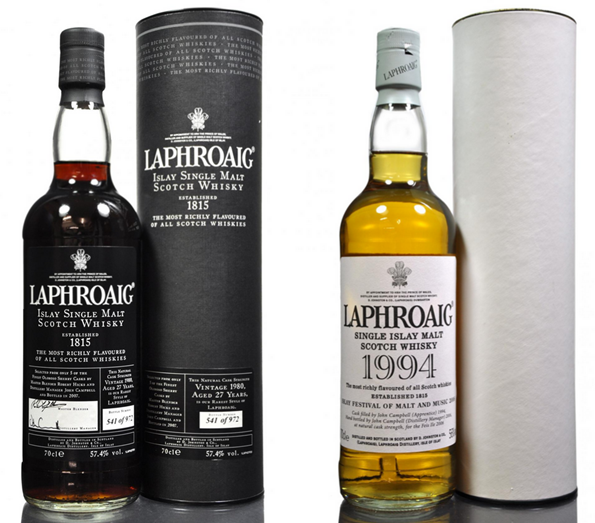 Had the set of three bottles been purchased in 2011 for £4,800 they would now be worth £13,300. That’s £8,500 ahead of their 2011 auction price and an almost unbelievable £13,000 increase in value from their original retail price. With this level of increase over recent years, is there any scope for future growth? That’s clearly impossible to answer; however, the current high demand for Black Bowmore doesn’t look like it will abate any-time soon. In fact general Bowmore values have been hardening rapidly over recent months meaning the likelihood of plummeting values for these three icons looks slim (never say never though). 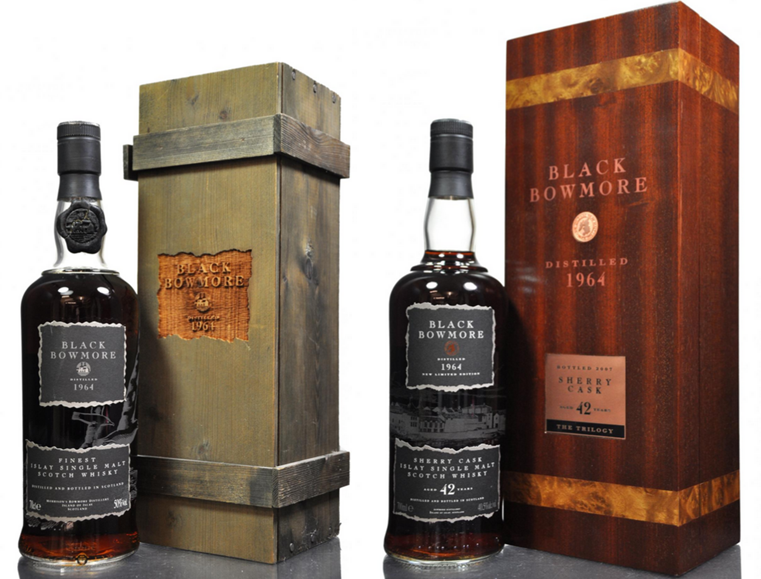 We frequently talk of the right and wrong bottles from a collectors/investors perspective; in our view the first three Black Bowmore’s don’t get much more right! Pure bottled icons. Our hearty thanks go to Morrison Bowmore Distillers for their contribution, their images … and of course for releasing such exceptional Scotch!